The team working on the K-Way Motus are a friendly bunch, in that enviable, effortless way most Italians seem to be. The project started life in 2006 at the Mechatronics Lab of the Politechnic University of Turin (Politecnico di Torino) and was moved over to Actua S.r.l. and TTW S.r.l., spin-off companies of the Turin-based University hosted in the Incubatore di Imprese Innovative del Politecnico (Politechnic University Incubator of Innovative Enterprises). 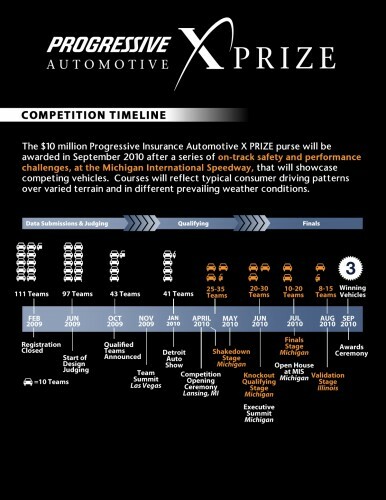 Now after 4 years of development the K-Way Motus team are set to take part in the 2010 Progressive Automotive X Prize which officially kicked off on April 26th with a “shakedown” event designed to eliminate teams that are insufficiently prepared for the further stages of the competition. 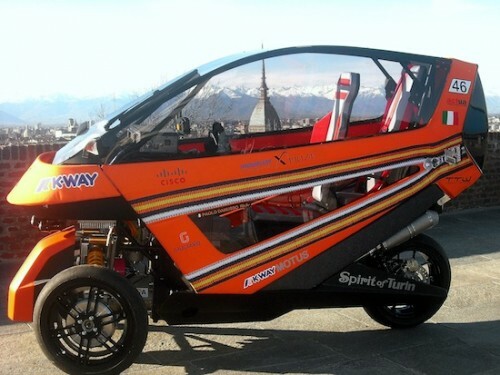 The K-Way Motus is a 3-wheeled hybrid car designed to tilt into corners in a similar fashion to the Piaggio MP3 Hybrid scooter, however the aerodynamics and crash protection of the Progressive Automotive X Prize entrant is far superior to that offered by the Piaggio. The K-Way Motus features a seating capacity for 2 people in a tandem configuration and with electric motors in both the front wheels which offers great road holding ability as well as full regenerative braking. The hybrid drive train is designed to work in both electric only and a combination of electric and gasoline (which offers more power). The K-Way team have already passed the initial shakedown tests and are well on their way into the next rounds of the competition, you can keep up with developments on all teams here and of course we will keep you up to date on the goings on with both the K-Way Motus and the overall Progressive Automotive X Prize competition. That actually looks better than the SmartCar…I would buy thatover the SmartCar…Too bad in American all our companies just want to make SUVs and Trucks.